ON a Saturday morning when most children are just getting up from their beds, Brent Valelo and more than 100 other young triathletes, aged 6-14, were already racing in the Alaska Ironkids race at the Subic Freeport. Valelo's hard work was rewarded when the 14-year-old member of Yellow Cab Tri Clark emerged as the fastest entry after coming in at 30 minutes and 22 seconds in the Boys 13-14 Age Group at the finish line in Remy Field. He was followed by Czar Manglicmot of Team PMI (31:43) and John Caleb of Transition in the event which saw the 11-12 and 13-14 age groups compete in a 300m swim, 9km bike and 2km run course and the 6-8 and 9-10 entries in a 100m swim, 3km bike and a 1 km run at the WOW World Activity Center at SMBA Island. 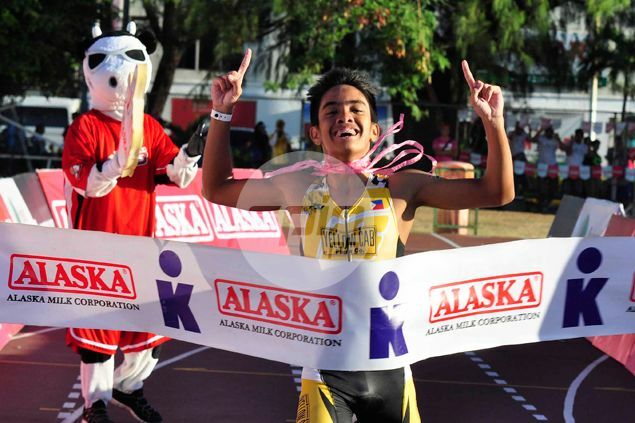 The youngster from Caloocan National Science and Technology High School said he simply willed himself to win his 10th race, relying on his strengths in cycling and running which he hopes to use in qualifying for the 2020 Summer Olympics. “I can do all things through Christ who gives me strength,” said Valelo, quoting his favorite Bible verse. Valelo’s training partner Nicole Eijansantos, 13, led the girls in the 13-14 group with a time of 34:52. Behind her was Christine Gaspar at second while Una Janua Sibayan came in third. The three daughters of national team coach Ringo Borlain all finished in the winners’ circle with eldest child Tara ruling the Girls 11-12 with a time of 34:09. Closely behind her is younger sister Samantha 34:40. In her first triathlon, youngest Franzcheska took second place honors in the 6-8 age group. Juan Francisco Baniqued of Trigear took the Boys’ 11-12 years old title, second went to Jose Manuel Arao and Karl Rafael Pamakid completed the top 3. In the 9-10 age group, first place went to Mark Grist of Sabak Tri, second to Matthew Alumbres and Juan Miguel Tayag finished third in the boys bracket while Team Bullshark Tri’s Alison Ann Noble and Patricia Tolentino came in first and second, respectively, in the distaff side. In third place was Ana Maria Mempin of Davao Trikids. Karl Ramos of 2600 Tri Team topped the 6 to 8 age group, followed by Jabrielle Delizo and Reggeal Victoria. In the girls’ side, Justicia Tan of Tri Clark edged first timer Franchezka Borlain while Caitlin Gaw finished third. Sunrise Events president Wilfred Uytengsu said he was elated with the huge turnout. “It’s really nice to see the parents supporting their kids promoting a healthy lifestyle, a lot of kids today spend a lot of time on their iPads or Playstations. It’s important to develop your technical skills but you also have to be physically fit,” said the Alaska head.